"Sometimes when everyone's a little bit upset with you, maybe you have a good balance — that's probably a good sign," said House Ways and Means Committee Chair Dustin Burrows, the author of the legislation and a Lubbock Republican. "We worked really hard; we talked to a lot of different constituencies" and a lot of members. "I think you'll see in the committee substitute, the work product and a lot of collaboration." As amended, HB 2 now exempts community colleges, emergency service districts and hospital districts from abiding by the 2.5 percent election trigger. Another provision lets certain districts, including cities and counties, bank unused revenue growth, so long as they average below 2.5 percent over five years. And new "revenue enrichment" language could cushion some taxing units by letting them raise $250,000 in new property taxes a year, even if it exceeded the growth rate. The threshold, set at $250,000 for 2020, would be adjusted by the state comptroller annually, based on inflation. The carry-over and revenue enrichment provisions do not apply to taxing units exempt from the lower 2.5 percent election trigger; those entities would be subject to an automatic election if annual revenue growth surpassed 8 percent. Taxes raised on new developments remain excluded from the revenue growth calculation. Democrats on the committee offered four amendments, all quickly defeated in party-line votes. Currently, voters can petition for an election if property tax revenue growth exceeds 8 percent, a rate set during a period of high inflation in the 1980s. State leaders have touted the lower chamber's proposal and a Senate companion as an overdue correction and as a needed check on spiraling property tax bills. But critics say the reform efforts would not reduce tax bills, just slow the rate at which they grow — and, in the process, hamper local officials' ability to provide public services for growing populations. In Texas, property taxes keep local governments like cities, counties and school districts operating and pay for everything from police officers' salaries to classroom textbooks. Here's how the taxes are calculated and how they could change in the 2019 legislative session. Chief among the legislation's detractors have been city and county leaders. In a letter sent in February to Burrows, a coalition of mayors said the 2.5 percent trigger was not “workable” — but that they were "committed to working with you and your fellow legislators as we strive to make real progress on these issues." They thanked the legislators for initially exempting money earmarked for debt payments from the revenue growth calculations. A change in the draft bill could earn those officials' ire: New certificates of obligation and other non-voter approved debt now count toward the 2.5 percent growth tally. A form of tax revenue-backed debt, the certificates are supposed to offer local governments the flexibility to fund services under exigent circumstances. But the financing method has proven controversial to some state officials, who say it can leave voters on the hook for projects they did not approve. Bennett Sandlin, executive director of the Texas Municipal League, said the new approach to debt is a "step backwards" that would render certificates of obligation "almost unusable." "Cities use certificates of obligation when they have to act quickly, in times of emergency," Sandlin said. The benefits of the carry-over provision could also be minimal at 2.5 percent, he said, due to inflation. A vote was called on the new draft around 1 a.m., drawing support from the seven Republicans on the panel and one Democrat, state Rep. Ryan Guillen, a Rio Grande City Democrat and the vice chair of the committee. The three remaining Democrats were opposed. 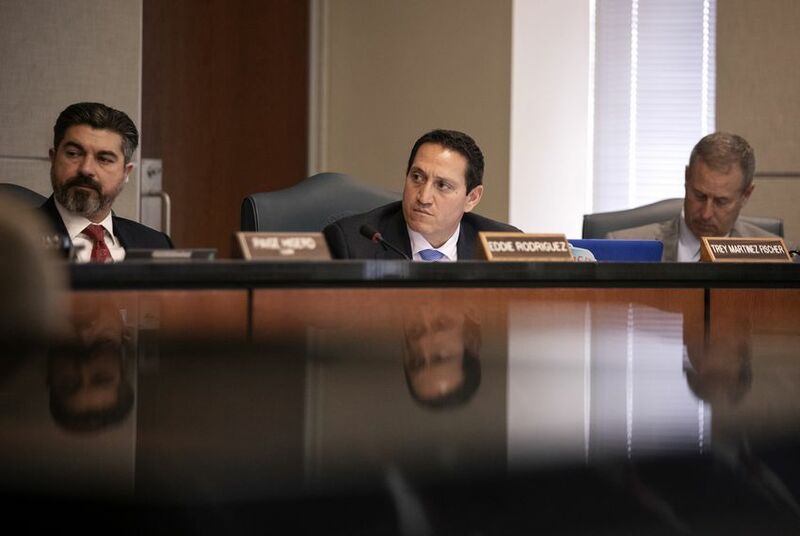 "This is not the last chapter in the bill"
“Is the committee going to provide us with some Red Bull?” asked state Rep. Trey Martinez Fischer, a San Antonio Democrat. He later told reporters that some of the Democrats' suggestions were not included in the new draft and that the rollout had been a "disappointment." "Everybody on this committee has been working hard to find a solution," said Martinez Fischer, who noted some changes he favored were included in the new draft. "I'm disappointed at this juncture that those conversations haven't manifested in policy I'm looking for and members of the committee" are looking for. "I know this is not the last chapter in this bill," he said. The new version also provoked early pushback from the opposite end of the political spectrum. Michael Quinn Sullivan, head of the hard-right Empower Texans group, warned readers in an email Wednesday that the committee was not taking a conservative enough approach to the legislation. Lower chamber leaders, he wrote, were preparing to "sell out taxpayers" and "gut" the priority reform measure. "Burrows will reportedly exempt school districts and many other entities from the core reforms ... including the 2.5 percent revenue-growth trigger that forces a public election!" Sullivan wrote. The new draft will head to the Calendars Committee and then to the House, where it will be debated by the full chamber. The Senate's measure, which was quickly pushed through the chamber’s Property Tax Committee in February, was modified to allow small taxing units to opt in to parts of the reform bill. As first drafted, cities, counties and special taxing districts — like those for community colleges and certain hospitals — were exempted if their sales and property tax levies did not top $15 million. Both chambers' versions of the legislation also make a host of widely supported modifications to the appraisal and protest process, with an aim of making them friendlier to taxpayers. Neither measure has been debated on the floor of its respective chamber. Disclosure: The Texas Municipal League has been a financial supporter of The Texas Tribune, a nonprofit, nonpartisan news organization that is funded in part by donations from members, foundations and corporate sponsors. Financial supporters play no role in the Tribune's journalism. Find a complete list of them here.